click for larger pic This is a very rare item that I just added to my collection. 1951 Frazers were made from leftover 1949-50 Frazer bodies. One of these leftovers in substantial numbers was the Traveler/Vagabond. 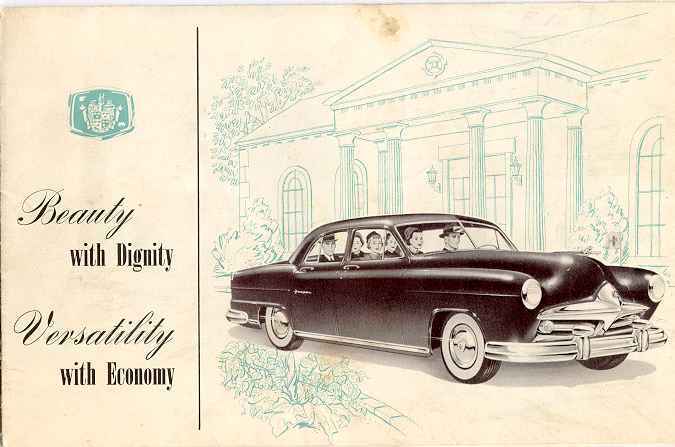 This folder describes a special application for the 1951 Vagabonds -- as a mortuary car! Strangely, one must search diligently for any mention of the term "Vagabond" in the folder. Finally in small print one finds "This unique multi-purpose 1951 Frazer is popularly known as the Frazer Vagabond." The folder measures 9 x 5 7/8 inches closed and opens to 18 x 11 3/4 inches. Colors used are black, white, and a blue-green. Note the label "Beauty with Dignity" is a clue to the subject of this folder. You can also see that there are smudges and small imperfections on the outside of the folder -- but when an item is this rare we take what we can get! As I sit looking at the folder I can make out where someone marked a price of $10 in pencil on the front. Current market price for this item is in the range $50 to $75 depending on condition. The Vagabond was hyped as a "multi-purpose" car for the mortuary. It would thus replace two or more single-purpose vehicles in the morturay fleet. Uses listed include general utility, for flowers, for family car, for pallbearers, for casket transportation, for miscellaneous transportation, and for ambulance use. In addition to the drawings shown, photographs show a stretcher being loaded into a Vagabond and one loaded with a casket. For carrying the casket a special conversion kit, featuring a single front seat, was available from KF to allow room for the length of the casket. Note is made that leading manufacturers of funeral equipment have cots, stretchers and other standard or special equipment for use in the multi-purpose Frazer.